Diego Muñoz is a superstar chef. He spent the first part of his career working at some of the world's top restaurants: the Adriàs' El Bulli and Andoni Luis Aduriz's Mugaritz in Spain, Pascal Barbot's Astrance and Guy Martin's Grand Vefour in France, Massimo Bottura's Osteria Francescana in Italy, then off to Australia at Bilson's in Sydney. 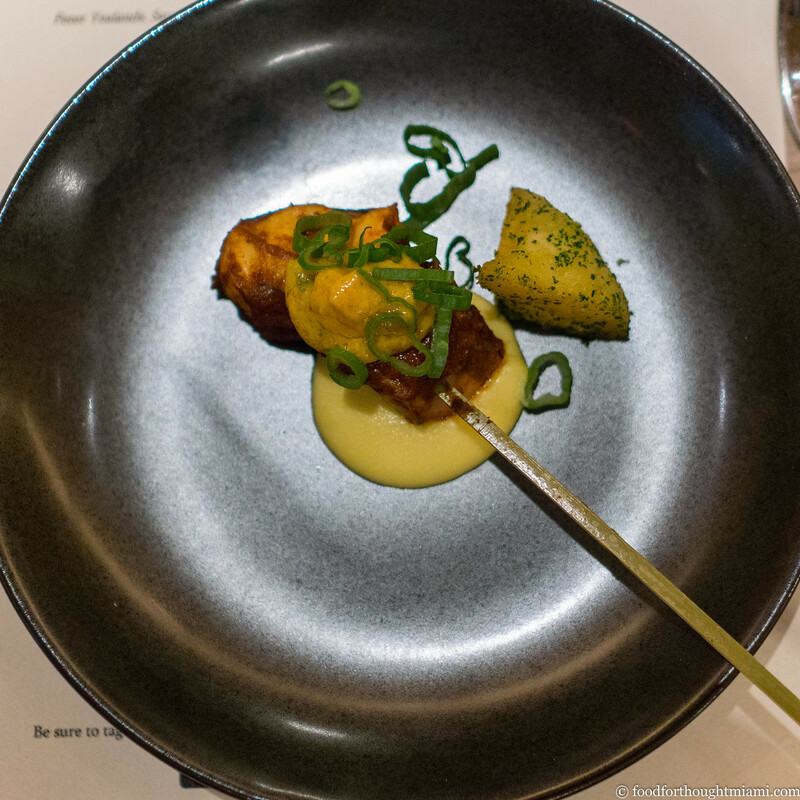 After literally cooking his way around the world, he returned home to Peru, where he ran the kitchen at Gaston Acurio's high-end tasting menu flagship, Astrid y Gaston, for four years. During Muñoz's tenure, Astrid y Gaston worked its way from No. 42 to No. 14 on the much-hyped (and much-criticized) S. Pellegrino World's 50 Best Restaurants list. When Ferran Adrià was in town last year for a "Gastronomy Congress" at Miami Dade College, Muñoz was one of the chefs on stage doing a demonstration, along with David Gil and Fran Agudo of brother Albert Adrià's restaurant, Tickets. Then at the beginning of this year, Muñoz left Astrid y Gaston, with plans to embark on another year of world-wide cooking adventures. 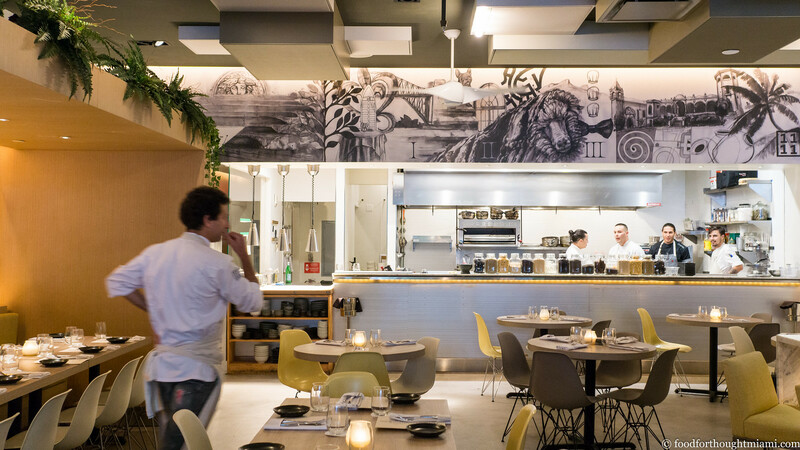 So when I stumbled across a small Peruvian restaurant that Muñoz had opened a few months ago in Miami, with no fanfare whatsoever – well, surprised would be an understatement. We put the Cobaya wheels in motion to set up a dinner, which we were able to schedule while Muñoz would be in town this Friday. 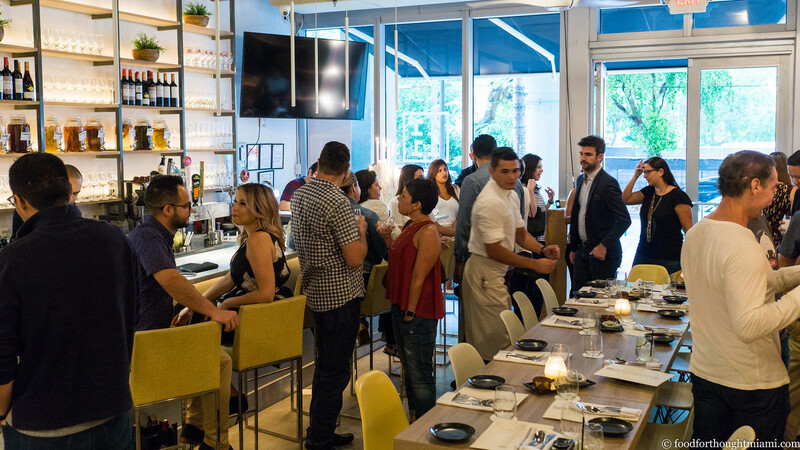 Muñoz's restaurant, 1111 Peruvian Bistro, occupies the space that used to be home to BoxPark, in the ground floor of the Axis Brickell condo building. 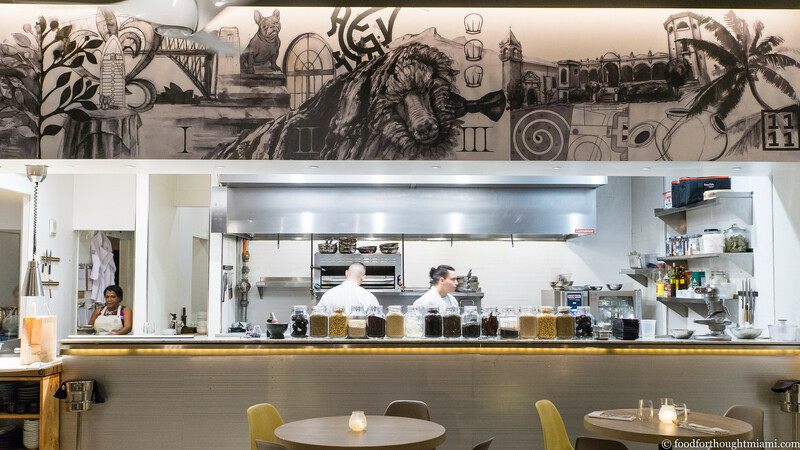 It looks much the same, the most notable addition being a mural across the top of the open kitchen which appears to track Muñoz's career – I recognized the El Bulli bulldog, that shaggy sheep looks like the ones roaming the Basque countryside outside Mugaritz, the bowtie must belong to Tony Bilson, and there's Casa Moreyra, which houses Astrid y Gaston. At the end, beyond the palm tree, is 1111. (You can see all my pictures in this Cobaya Muñoz at 1111 Peruvian Bistro flickr set). 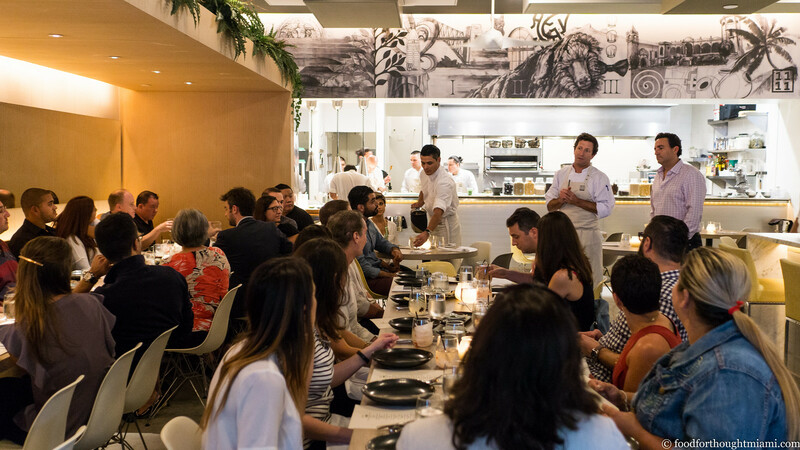 Once we got everyone settled into a few communal tables, Chef Muñoz introduced himself to the group, and servers started bringing out the first round of an eight-plus course dinner. Many food cultures have their versions of meat-on-a-stick. For Peruvians, it's anticuchos. Veal or beef heart may be the most traditional, but it could be just about anything: chicken livers, steak, fish, shrimp, or, as here, octopus. The meat had a nice spring to it without being chewy or bouncy, It had been rubbed with an anticuchera sauce bright with chiles, vinegar and spices, and was served over a creamy corn purée with a crispy potato alongside and a dab of salsa carretillera on top. Peru's most famous dish, though, is surely ceviche. But Muñoz is not a traditionalist: he has made ceviches of sea urchin, clam, apple, melon, avocado, and I'm sure any number of other ingredients. 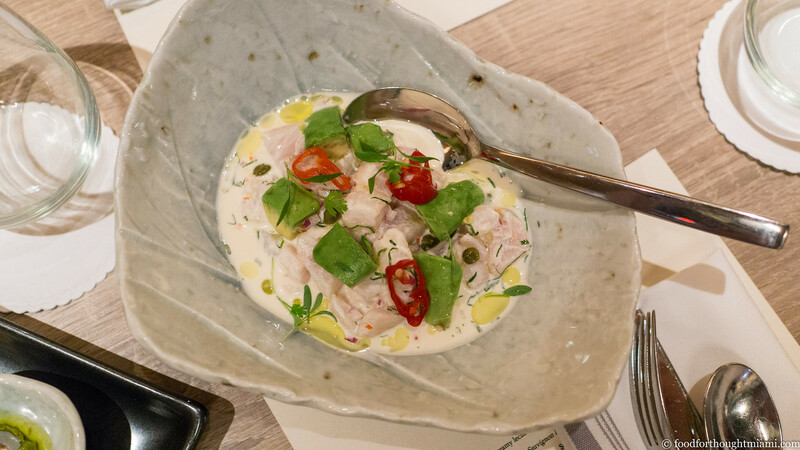 Here, the base was the customary cubed whitefish, but it came swimming in a creamy, tangy leche de tigre, garnished with soft chunks of avocado and potent sliced fresh chiles, then given an Italian accent with briny capers and a drizzle of olive oil. It was a very good ceviche, and oddly reminiscent (in a good way) of a vitello tonnato. Tiradito is a Japanese-inspired cousin to ceviche, using thin-sliced raw fish which is quickly marinated in citrus a la minute. 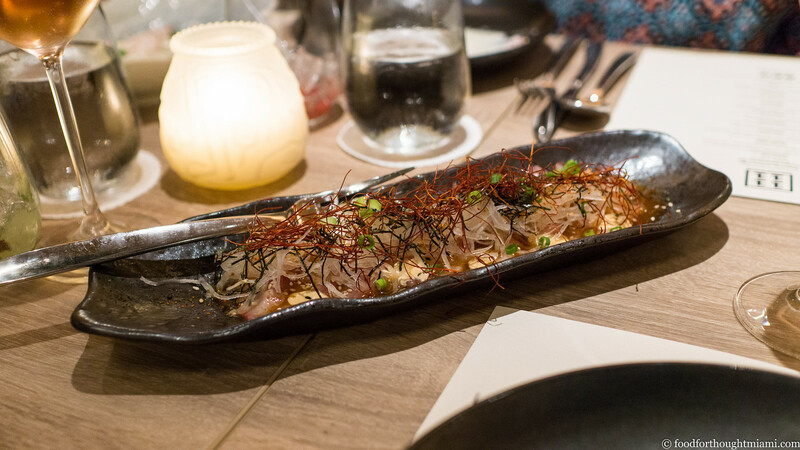 Here, this "nikkei" style tiradito was doused with a tamarind leche de tigre, then topped with a creamy eel sauce mayo, shredded daikon radish, thinly julienned nori sheets, and spicy chile threads. There were some good flavors here, though I found the eel mayo heavy-handed. The first time I heard of a causa, it sounded terrible to me: what kind of a dish uses cold mashed potatoes? Yet I've fallen in love with them. When done well, the potato is rich, smooth and creamy, often with just a faint undertone of chile spice, a humble ingredient turned into a luxuriously silky vehicle for toppings that might include shrimp, or octopus, or tuna salad. 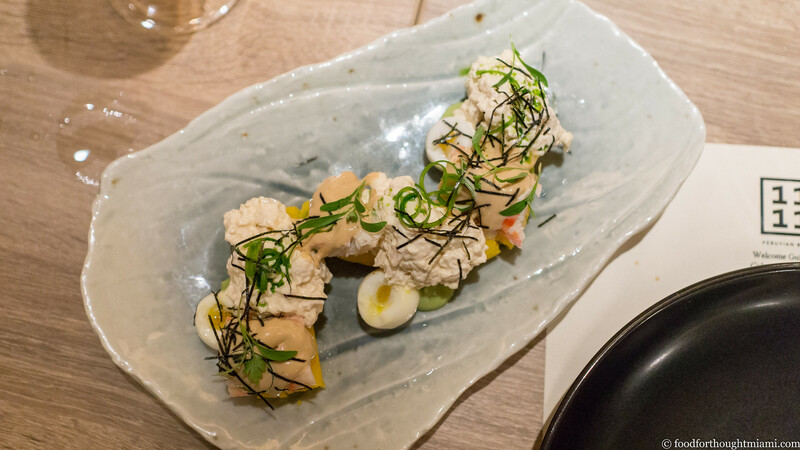 Here, Muñoz formed the causa into a serpentine shape, and crowned it with king crab and daubs of creamy poached chicken salad, served with soft-cooked quail eggs and garnished with a bouquet of micro-greens. 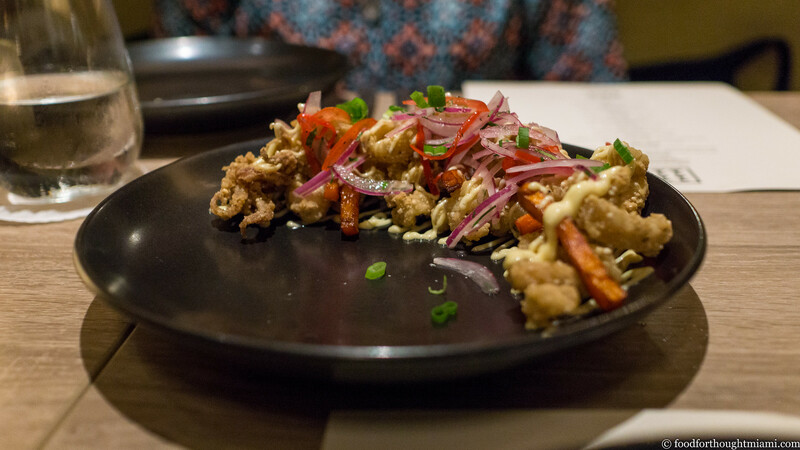 Jalea – fried seafood – is another regular feature on many Peruvian menus. And honestly, I'd figure there's only so much you can really do to elevate fried calamari. But this was a very good version, done in a Szechuan salt and pepper style, with a cornmeal coating that was aggressively and delightfully crispy, all topped with a colorful salsa criolla. Aji de gallina is still another Peruvian staple, a stew of shredded chicken in a creamy, nutty sauce mildly spiced with aji amarillo chiles. 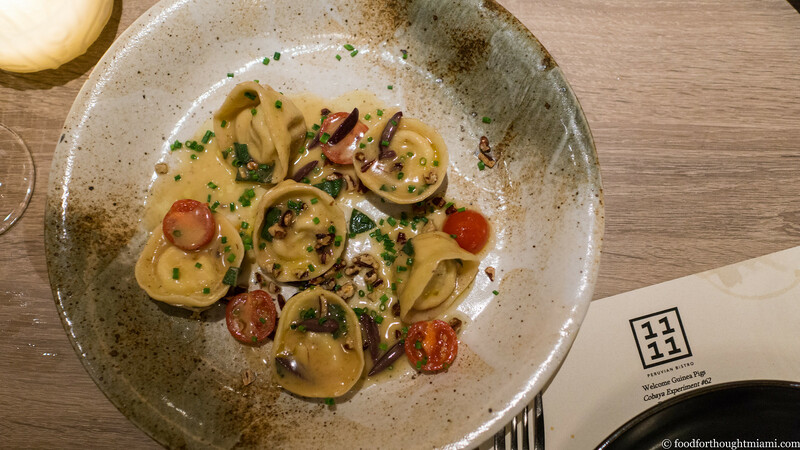 Here, Muñoz starts with the traditional dish, and uses it as a filling for tortelloni, tossed with crumbled pecans, slivered botija olives, halved cherry tomatoes and fresh sage. 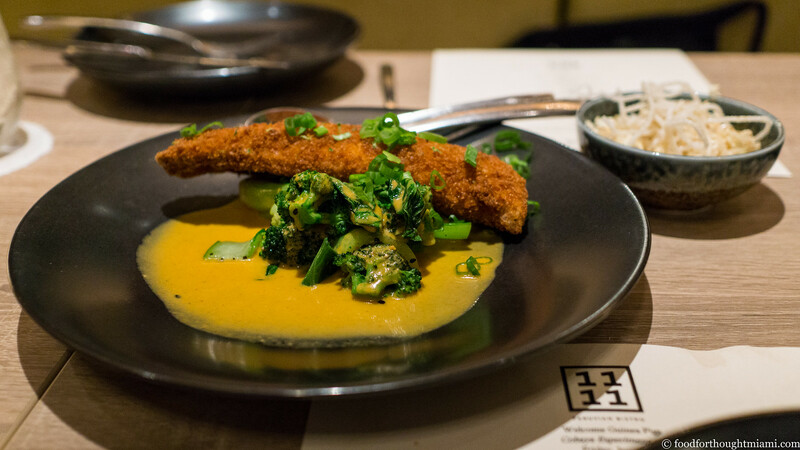 That was followed by a crisp fried filet of snapper, served over an intriguingly spicy peanut curry sauce and bright, fresh Asian greens. But maybe my favorite part was the "white chaufa" alongside, a simple but delicious all-white fried rice which may have been merely rice, egg, and sesame oil, topped with a tangle of puffed rice noodles. Nearly every Peruvian restaurant has lomo saltado on the menu – typically, a stir-fry made with strips of steak, peppers, onions and tomatoes tossed with french fries, and served over rice for some starch-on-starch action. None serve one as refined as this. Here, tender filet mignon is sliced to reveal its rosy interior, napped with a lomo saltado sauce balancing soy sauce umami and vinegar sting, and plated with a scatter of crisp potatoes and lightly stir-fried vegetables that still retain some snap and vibrancy. 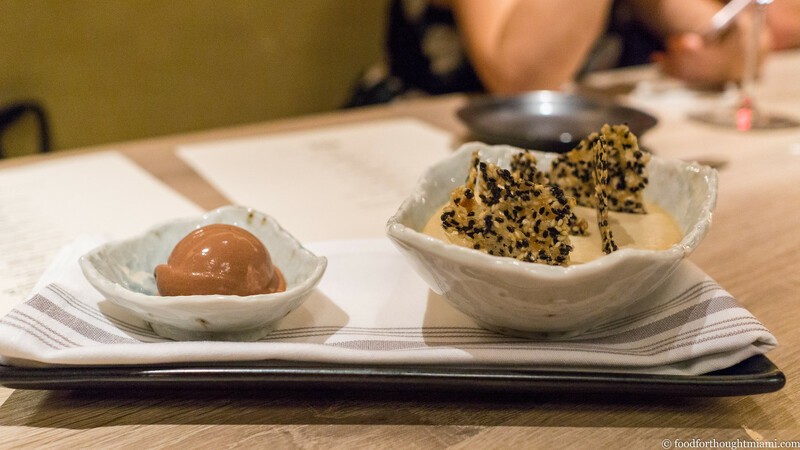 As a first dessert, a lucuma "cassonade," the Peruvian fruit (which has a caramel, nutty, sweet potato flavor similar to mamey) flavoring a mousse topped with crispy black and white sesame tuiles, served with a creamy chocolate sorbet alongside which highlighted the fruity side of the cacao flavor spectrum. 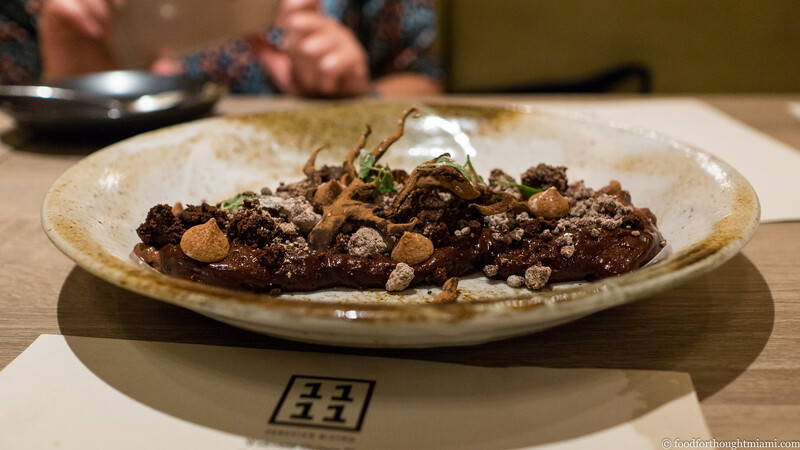 And next, chocolate "temperatures," with multiple variations on a theme: creamy, slippery dark chocolate and milk chocolate puddings, little chocolate drops and branch-shaped tendrils, all overrun with a powdery chocolate rubble. 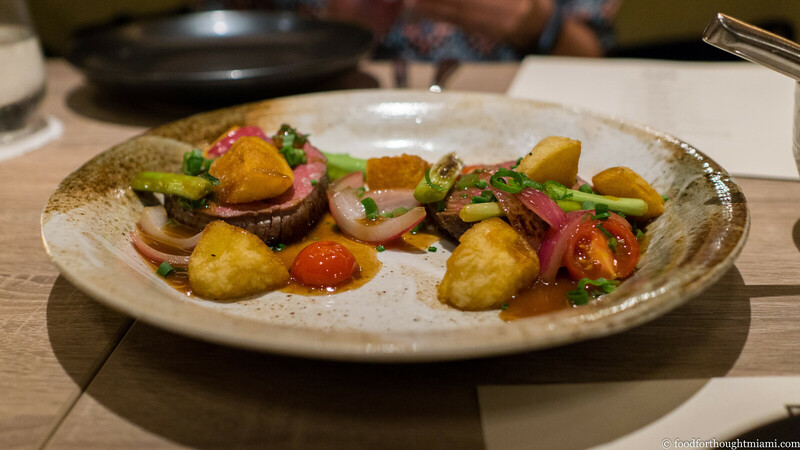 If you'd never heard of Diego Muñoz, or if you had no idea that one of the world's top Peruvian chefs had opened a restaurant in Miami, I think you'd be thrilled to find such good food at an unassuming little spot in Brickell. But here's the thing. I was, to be honest, underwhelmed when I sat down at the table and read the menu for our dinner. It did not have nearly the ambition or excitement I'd expect from someone of Chef Muñoz's pedigree. 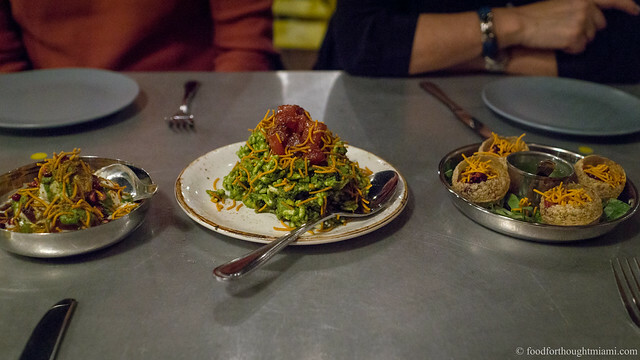 That's not to knock the meal: I thought the food was generally very good: fresh, well executed, flavorful and interesting. And indeed, every single dish was better than the menu descriptions would have led me to expect. But it didn't strike me as terribly adventurous. It felt more like "Introduction to Peruvian Cooking" than a master class, and with someone of Muñoz's reputation, it seemed a bit like having Albert Einstein teach Physics 101. We encourage chefs to explore their creative impulses, to do something different when they cook for us, and indeed the one and only request we consistently make of them is a very simple one: do something off-menu. Don't serve us a dinner that someone could walk in and order at your restaurant the next day. So I was even more disappointed when I looked the next day and saw that the restaurant's regular menu includes all the same dishes we were served. Yes, it's a new restaurant, and many of those items are new to the menu, and I don't think any of our guests had been there before, and so this was all new to them (and me, for that matter) anyway. But this is not what we set out to do when we organize these Cobaya dinners. Clearly, something got lost in translation. We let the restaurant and their PR firm, which helped coordinate the event, know of our disappointment. It's not often I sing the praises of PR firms, but Rockaway PR was immediately responsive and incredibly gracious: as a result, we'll be refunding 50% of the cost of everyone's seats at this dinner. It was a generous and thoughtful gesture – not requested or expected by us – and a sign of folks that really do want to please. So the good news is that if you weren't at our dinner, you actually could have this same meal at 1111 Peruvian Bistro tomorrow. Indeed, I'd encourage you to do exactly that. That time when @Diego_A_Munoz opened a restaurant in Miami - @1111perubistro - and none of the food world seemed to notice. R.I.P., Matt Hinckley's Everglades Gumbo. With its confluence of indigenous, Japanese, Chinese, and Italian influences, Peruvian food has been called the original fusion cuisine, and indeed Gaston Acurio has published a book called "500 Years of Fusion." I should probably qualify that comment by noting that I've not tried the version at La Mar, the restaurant opened by Muñoz's one-time boss Gaston Acurio across the street in the Mandarin Oriental and headed up by Chef Diego Oka.